Abstract: For scientists involved in the study of drug metabolism the challenge of accurately and rapidly identifying metabolites is met using a variety of LC/MS techniques and software packages. While most instruments vendors offer software to assist in the identification of metabolites, they are a hindrance in a multi-vendor laboratory, where they lack the flexibility and customization required. Most users have to then resort to purchasing additional software and typically use Microsoft Excel to complete their workflow. 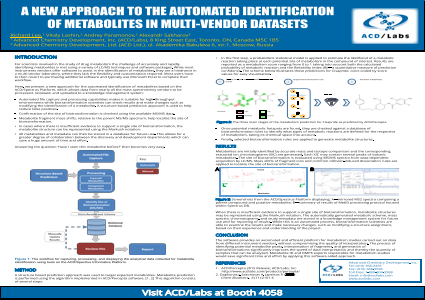 Summary: This poster presents a new approach for the automated identification of metabolites based on the ACD/Spectrus Platform, which allows data from nearly all the mass spectrometry vendors to be processed, reviewed, and uploaded to a knowledge management system.